This entry was posted in Postaday, Space and tagged Big Dipper, celestial north pole, Little Dipper, navigation, north star, Polaris, space, the North Star. Bookmark the permalink. At last something I can grasp! (Just kidding) I do know a few constellations but I think it’s good that you carry us along in baby steps. Baby steps are good. (and my name isn’t Bill Murray). I’ve lived in Johannesburg for 30 years and never once seen the North Star. And I have looked… believe me. I think you make some of this stuff up. Many years ago when a bunch of us ex-pats were at a News Years Eve party in Johannesburg someone called everyone to the balcony to see the North Star – there was much “homesickness” at that time and many of the crowd were due to return to Mud-Island in the New Year. I was halfway off the couch when the penny dropped so I sat down again again and grinned as the drunken bums headed out to gaze stupidly at the night sky. Wonderful post, it took me back to the day when I learned my first constellation & began dreaming of the stars. 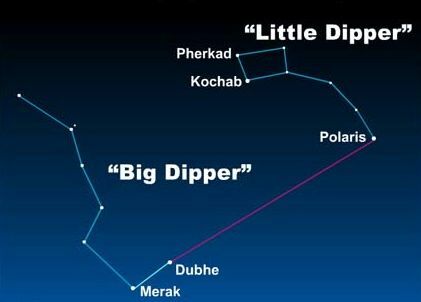 From a friend with high regard for the Big Dipper…..
Perhaps you know that a design featuring Ursa Major was chosen as the Alaska State flag in 1927. They held a competition for a design for a new flag and it was won by a thirteen year old Aleut student who was living in an orphanage in Seward. His name was John Bell (Benny) Benson. Alaska did not become a state until 1959 and became the 49th star on the US flag, followed in the same year by Hawaii. I became familiar with the flag during the 70s while working on the Alaska cruises. We used to see Alaska State Ferries passing by every day. Their livery was blue hulls with a gold stripe and the flag was displayed on the funnels. CHAPTER 9. STATE SEAL, FLAG, AND EMBLEMS. The design of the official flag is eight gold stars in a field of blue, so selected for its simplicity, its originality, and its symbolism. The blue, one of the national colors, typifies the evening sky, the blue of the sea and of mountain lakes, and of wild flowers that grow in Alaskan soil, the gold being significant of the wealth that lies hidden in Alaska’s hills and streams. The stars, seven of which form the constellation Ursa Major, the Great Bear, the most conspicuous constellation in the northern sky, contains the stars which form the “Dipper,” including the “Pointers” which point toward the eighth star in the flag, Polaris, the North Star, the ever constant star for the mariner, the explorer, hunter, trapper, prospector, woodsman, and the surveyor. For Alaska the northernmost star in the galaxy of stars and which at some future time will take its place as the forty-ninth star in the national emblem.